This season’s latest must-have? Pair a super simple hairstyle with graphic eye make-up. This is the winning combination to create an elegant, yet daring, look. The trend. Loose hair tucked into the top of a roll-neck sweater, much like the faux-bob. Hair was swept behind the ears and structured thanks to a side parting. Statement make-up drew all of the attention to the model’s eyes which were defined using thick, graphic lines on the lid in a multitude of different colors. 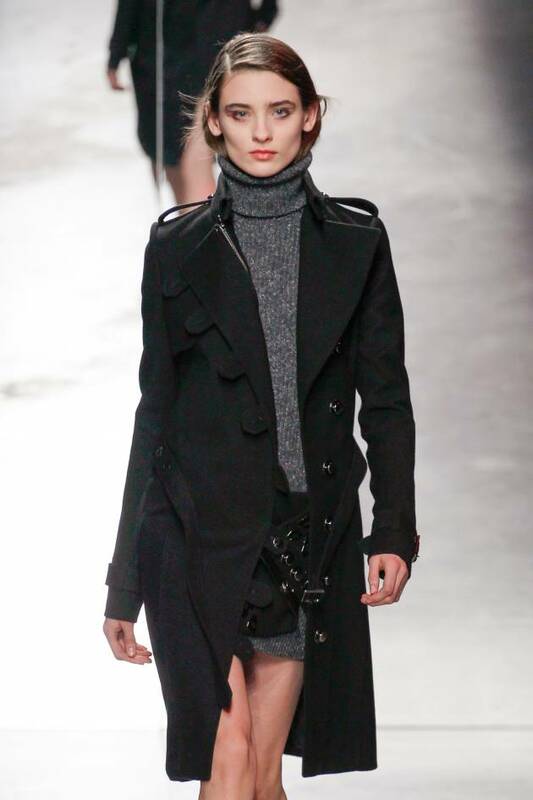 This quirky look was spotted on the Anthony Vaccarello Autumn-Winter 2014-2015 runway at Paris Fashion Week. Who can wear simple locks with graphic eye make-up? Anybody who is open to experimenting with eyeliner whilst remaining modern and original. The simplicity of this hairstyle means you can be sure to avoid a fashion faux-pas. This combination is ideal for an evening occasion when you want to turn heads. The statement nature of this beauty look, however, means that it might not be suited to an office environment! Get the runway look. Create a side parting on clean, detangled hair. Tuck the front sections behind your ears and place your lengths inside the neck of a roll-neck sweater to create the illusion of a bob. As far as hairstyles go, they don’t come much simpler than this! Moving onto make-up, start by creating an even complexion, then focus all of your attention on your eyes. Take a chunky eyeliner pen or pencil and frame your eyes with graphic lines. The one rule you must keep in mind for this look? Let your imagination run wild!